This is the story of how I got my little kitten Alloy. It was the end of the school year and my ninth grade biology class was hatching chickens. When my chick hatched I was super excited and begged my parents to let me keep it. My cat out of our three cats had been missing for a little over a month - Brisk was really attached to me and had never been gone for so long so we assumed she wasn't coming back. I was upset over this so my parents decided to let me keep my little chick. I loved my little chick which I named Area to death. But one night while I was sleeping my poor little baby fell into its water dish and died. I cried for hours missing my little one. To try to distract myself from Area's death I went shopping with my parents. While we were heading home we stopped by our local pet store. I remembered going there the day before with my friend and seeing two adorable Siamese kittens. When I went in with my parents there was only one left. My parents decided to get the little kitten for me. When we bought him from the store they only said that the kitten was a male and that was it. When we got home I first named my kitten Aoi because it means blue in Japanese, and he had bright blue eyes. But Aoi was too hard for my younger sibling to say so I renamed him Alloy. Alloy really helped me through the sorrow of losing my little chick and my cat. He's super hyper and likes to jump and climb my leg. Alloy loves to sit on my shoulder and sleep there - in fact he's doing it right now. 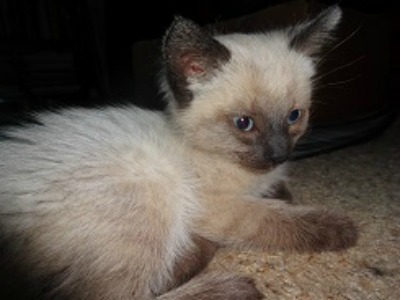 After researching Siamese I think he's a Seal and about twelve to thirteen weeks old. He has the cutest little high pitched meow, and he's normally quiet unless you get him on a roll. Alloy has saved me in many ways and I'm excited to have my first Siamese cat. Happy that you found a kitten to love and take away a bit of the pain of loss that you felt. I have two Siamese girls in my life, Ella and Lily and they bring me joy every day. Lily is snuggled up alongside me as I write this. Enjoy Alloy and I wish you both a long and happy relationship. Thanks for the advice Gwyn. I love my little kitten to death and wouldn't give up those little blue eyes for anything. I'll do my best to take care of him in every way possible. You have taken your first step into Siamese paradise and are on your way to realising how ensnared you will become in the unique world of theirs. Stay with them to experience the joy of a constant companion who will never judge but often complain and always want your total attention and love. If this is not for you - get out now - it's your only chance of freedom from a lifelong love affair with a few Siamese who will always want to dominate your life and be there for you through thick and thin ... for ever!